The French never heard of it, but the Russians love it. French-style meat is one of the most delicious, most popular and easy-to-make meat dishes in Russian cuisine. Every Soviet citizen knew how to make French-style meat, and for decades it has been one of the most popular baked dishes in the Russian diet. Simple ingredients, quick preparation and the chance to easily satiate guests make it a popular fixture on the holiday dinner table. Paradoxically, the French do not know that French-style Meat is a Russian invention, and most Frenchmen have never heard of the dish. The closest equivalent in French cuisine, in terms of preparation and ingredients, is the Baeckeoffe village casserole, which actually originated in France's Alsace Region, whose culinary tradition is predominantly marked by German influences. 1. Lay out the small chunks of meat on a baking tray smeared with vegetable oil. 2. Cover the pork evenly with a layer of onion rings. 3. Cut the peeled potatoes into thin slices and place them on top of the onions. 4. Grate the hard cheese and sprinkle it over the meat. Afterwards, profusely cover it with mayonnaise using a tablespoon or a cooking brush. 5. Bake the dish at a temperature of 180-200 degrees Celsius for about 30 minutes. You can tell if the dish is ready by the top layer of cheese. If the crust is golden, then the French-style Meat is ready. Turn off the oven, take out the dish and let it cool for 10 minutes. The order of layers may vary depending on your preferences. 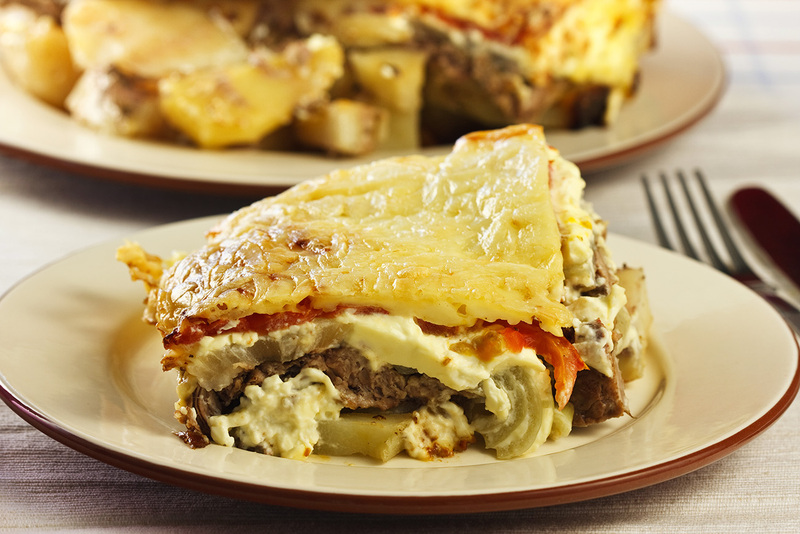 The bottom layer can be onions to create a stratum between the meat and the baking tray, or potatoes, which will result in the dish saturated with juicy fat. Some people make French-style Meat without potatoes. In this case, the pork chunks should be larger. Some don’t use mayonnaise, but the cheese-mayonnaise layer should always be on top, creating an aromatic gratin cheese crust while the dish is in the oven. French-style meat is a special dish for me, but to be honest, until some time ago I never made it. One day, however, I came across an ad for a cooking competition and decided to participate. Rarely do I respond to such proposals, but my inner voice suggested that I prepare something particular. The idea of making French-style Meat came to me immediately. I guess I remembered my childhood, when this dish was associated with New Year’s and other festive holidays. Without looking in a cookbook, my wife and I decided to work intuitively. We placed the layers of meat, onions, potatoes, cheese and mayonnaise into a round pan, and we decorated the surface with mustard grains and coriander and "drew" a pattern resembling the form of the French musketeers' capes. Meanwhile I boiled two chicken eggs and used them to make two happy pigs, adding pieces of raw carrot to create noses, ears and tails. Mustard beads were used as eyes. Surrounded by the pigs, cherry tomatoes and green salad leaves, the dish impressed the jury and we won a prize - some home appliances and most importantly, professional cooking knives. I still use them with pleasure. Ever since then, I frequently make this dish at home, in different versions, including French-style Fish, in which I substitute the meat with a tender fish fillet.